"Spit tests are the future of easy, low-cost, efficient personal testing. Spit kits wilbe readily available over the counter for blood typing, STD testing, paternity testing, allergy evaluations, and more within 5 years."" 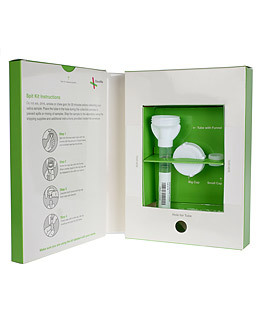 Do-it-yourself DNA tests (known as DTC or "direct to consumer" test kits, or "spit kits") are coming. With a spit kit, you simply buy an inexpensive kit online or from your local drug store, add saliva, and mail it into the testing lab. The test lab runs tests against the DNA and organic materials in your spit, like they would do a blood test. No needles! What about home DNA tests? "We are at the beginning of a personal-genomics revolution that will transform not only how we take care of ourselves but also what we mean by personal information"
©2010 SpitKits.com All Rights Reserved. Contact us by email to info at this domain.